Saturday, May 26, 11 a.m.–3 p.m., 14 branch libraries will take part in a How-To Festival, featuring different, short how-to presentations. The San Carlos Branch will be teaching how to: “Make Dog Biscuits” at 11 a.m.; “Talk About Books You’ve Never Read” at 11:30 a.m.; “Make a Shutterfly Scrapbook” at 12:30 p.m.; “Create a ‘Zine” at 1 p.m.; “Make Delicious Vegan Cookies” at 1:30 p.m.; and “Make a Flower Arrangement” at 2 p.m. Details of the presentations at all 14 branches can be found on our website. No pre-registration is required and patrons may attend one or all of the presentations. What fun! We thank the San Diego-based IDW Publishing company for supplying all of the comic books distributed throughout the San Diego Public Library system on May 5, for National Free Comic Book Day. Our thanks also to San Carlos Friends of the Library Book Sale Chair Ron McFee who got this ball rolling years ago with IDW, and all of the library staff who added to the day with costumes, crafts, and our own Star Wars Scavenger Hunt. During the entire month of May, in celebration of Star Wars Day on May 4, we are having a “Star Wars” Scavenger Hunt. Follow clues to find letters hidden throughout the library that will reveal a secret message sent from Yoda to Luke Skywalker. Turn in your deciphered secret message to the front desk to claim a prize! All ages may join in the hunt. May 23, 4–5:15p.m., Challenge Island, a science program for kids ages 8–12, presents “Jaguar Claws.” Kids will learn about jaguars, why they are at the top of the rainforest food chain, and design and create a jaguar claw game. Registration is required; call 619-527-3430. The 2018 Summer Reading Program, “Reading Takes You Everywhere,” runs June 1–Aug. 1. Register online at sandiego.gov/public-library, where you will find this year’s SRP rules for winning prizes. The San Carlos Branch is offering eight special SRP performances that will delight the entire family. All performances are on Wednesdays at 2:30 p.m., and last about 45 minutes. We kick off the summer on June 20, with “Passport to Animal Adventure,” brought to us by Pacific Animal Productions. Meet animals from around the world and learn about the adaptations required for survival in their unique habitats. Animals may include a fox, tegu, and kestrel. Our final SRP special event is Aug. 15, with Hullabaloo entertaining us with awesome toe-tapping music. Look for the entire summer activity schedule in the backpacks of Dailard, Green, Gage, and Benchley-Weinberger students. The Library Shop’s Where’s Waldo @ the Library contest will again run throughout the month of July. Patrons finding Waldo at each branch will receive a button designed by their branch. Ask our librarians for information on how you can enter the button design contest for the San Carlos Branch. May 8–31, the photos of published and award-winning photographer, Gerry Tietje, will beautify the walls of our Winer Family Community Room & Art Gallery. Amazing photos of birds, some caught midair catching prey, others on nature’s perches, are all part of this show. Tietje, a retired engineer, also depicts nature in pen and ink drawings brightened with watercolors. Meet this awesome photographer at his reception, Saturday, May 19, noon–2 p.m. Refreshments will be served. “Gorgeous” describes the San Carlos Garden Club’s “Arts Alive: a Show in Living Color.” Club members’ colorful floral arrangements were paired with paintings by Maria Louisa Dominguez and Barbara Stewart. Zandy Gelmaher, one of 142 guests, won the beautiful door prize plant. Thank you one and all! We anxiously look forward to the club’s next show. Interested in joining the Garden Club? Meetings are 11:30 a.m.–2 p.m. every fourth Tuesday, September–June. Call club president, Gayle Regan at 619-287-0175 for details. New members are always welcome. Friday, May 18, 2–3 p.m., join us for an enlightening talk given by the San Diego History Center. Hear and see what San Diego was like during WWI. New military bases were added to our landscape. Learn how San Diegans felt about the war and how they contributed to the war effort. 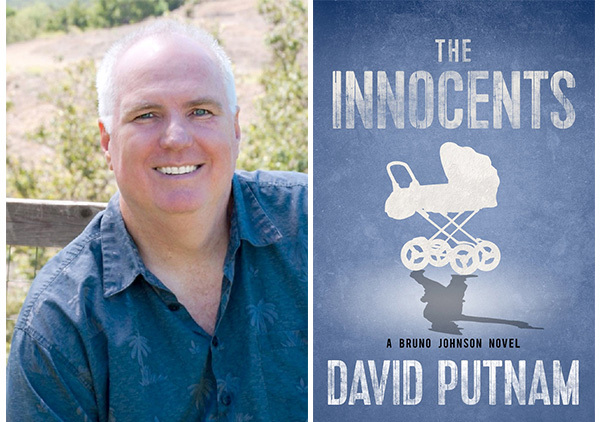 On Friday, May 25, 2–3 p.m., author David Putman talks about his novel, “The Innocents,” his first prequel of a planned four-book series, about the trials and tribulations of Bruno Johnson, a newly minted Los Angeles County Sheriff-Violent Crimes detective. Putman himself is a retired veteran law enforcement officer and detective with many exciting stories to tell. June 14, 12:30–2 p.m., the Library Book Club is discussing Chris Bohjalian’s, “The Sandcastle Girls.” This historical novel is the story of love and survival of a grandmother during the Armenian genocide in Aleppo, Van, and Gallipoli in 1915, as told to her grand-daughter, years later, through flashbacks. On June 8, 2–3 p.m., learn why adequate hydration is vital to good health at “Hydration for Health.” Learn about what factors influence hydration needs; what are indicators of being safely-hydrated, healthy beverage options and beverages to avoid, and helpful tips for staying well-hydrated. Every attendee will receive a free healthy snack and wellness guide with recipes and tips for healthy living at both events. — Sue Hotz is board member and publicity chair for the San Carlos Friends of the Library. Reach her at publicity@sancarlosfriendsofthelibrary.org.